Synopsis: A drama centered on a group of people searching for human connections in today’s wired world. 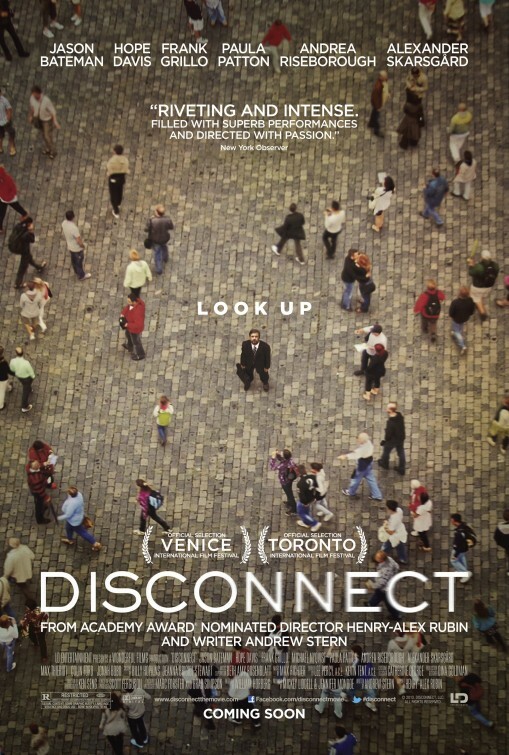 Review: Disconnect is that rarest of films…the kind that works like gangbusters while you’re soaking it in at the theater but one that gradually erodes away with each day that passes. It would be easy (and fair) to call this Crash 2.0 or Crash Online as the film is an ensemble drama with intertwining plots that circle around a single topic. Where Crash took a hard look at race relations, Disconnect takes a timely look at how the internet has worked its way into our lives with troublesome results. As is the case with many of these films with large casts and multiple story arcs, some of them work well and some of them fall flat. For me, the most effective of these involves a news reporter (UKer Riseborough, sporting a flawless American accent) doing some investigative journalism into underage teens using the internet to provide sexual favors/shows in return for gifts/money. Lured into this life, these teens are exploited and put into dangerous situations and it isn’t long before the FBI gets interested in the reporter and her relationship with an older teen (Thieriot) that agrees to go on camera to tell his story. Riseborough is a fascinating actress to watch and though she does equally good work in the sci-fi actioner Oblivion, it’s in Disconnect where we enjoy her more because the character has some interesting moral dilemmas to go through. Thieriot is impressive too as he graduates from Disney-fied teen films to a raw and revealing look into some dark material. There’s also a Catfish-y story about two young high schoolers (Ford and Avian Bernstein) that use Facebook to pose as a girl interested in an outcast (Bobo). Not just cyber-bullying but using the boy’s desire to connect against him, the two take their joke too far and soon find lives and futures are put into question when their target goes to drastic measures to free himself from their humiliation. Grillo (building quite the impressive resume recently with films like The Grey, End of Watch, and Zero Dark Thirty) and Bateman (Hit and Run, Identity Thief) are fathers that are directly affected by the actions of their sons and both do solid dramatic work. The least effective section involves Patton and Skarsgard as a couple with a marriage in trouble further put to the test when they are the subject of identity theft. Was it Skarsgard’s online gambling habit or Patton’s online support group friend that opened them up to having their bank accounts drained? That’s the back and forth issue they bicker about a lot…leading them to a confrontation with a man (Nyqvist) that may have the answers to their questions. Patton and Skarsgard don’t have the right chemistry to sell this and I found myself squirming anytime the movie shifted focus. How these different stories connect are mostly interesting and maybe sometimes too convenient but I won’t spoil how these overlap lest it ruin some of the discoveries the movie reveals as it goes on. Director Rubin (of the great documentary Murderball) and writer Andrew Stern clearly used Crash as an inspiration for the resolution (everything comes to a head in one high-tension series of slow-mo throat grabbers) and for the most part the film works. It was on my way home and in the days since that I saw how manipulative the film was. Though there’s a connection that most audiences will make with the movie, if you sit down and consider the film you’ll see some of the plot holes and disconnecting contrivances that don’t seem to be a big issue when the fast paced movie is being taken in. Perhaps because I enjoyed the film so much at the time and thanks to several strong performances, I’m giving it a higher rating than it deserves. Thoughts: As our reliance on technology grows, so our connectivity with living and breathing beings seems to be waning. The upcoming ensemble drama Disconnect seeks to explore the emergence of how much of our lives are spent on the internet and how intertwined we’ve become with the online world. From cyber bullying to identify theft to “catfish”ing someone, the internet has become a place for people to lose themselves. These types of films are always very interesting…especially when they are centered around a central theme as timely as this one.